Mayor Williams is proud to partner with the Drug Enforcement Administration, Discovery Education and the National League of Cities at the NLC's 2017 City Summit in Charlotte to help educate students, families and communities about the science behind opioid addiction, its impact on the brain and body, and methods to combat the growing opioid epidemic. 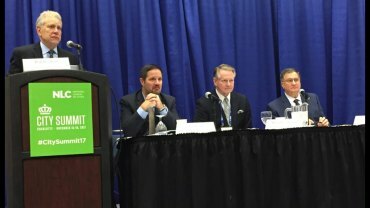 At the City Summit this morning, Mayor Williams participated in a panel discussion titled, "Operation Prevention: Educating the Youth on the Dangers of Opioid Misuse." It explored the epidemic, the federal response to it and the importance of educating K-12 students as a driving force for encouraging conversations about drug-free living. Mayor Williams and Fearns were joined by Norwin School District (Pa.) Superintendent Dr. William Kerr on the panel. It revealed a potential key to preventing the abuse of drugs was to reach children early, both in school and at home. Aligning with report findings, Operation Prevention is aimed at educating children and youth about the true impacts of prescription opioid and heroin abuse. Requiring no local sponsorship or underwriting to activate, Operation Prevention is available at no-cost for use today in every school, afterschool and community-based programs in the United States. The initiative combines virtual field trips, parent resources, digital tools, and a nationwide peer-to-peer video challenge that encourages teens to create 30-60 second original public service announcements. The PSAs are designed to engage students in life-saving conversations about the science of addiction. The DEA tapped Discovery Education to help activate Operation Prevention in local communities through the Discovery Education Community, the largest professional learning community of its kind. In addition, Operation Prevention is also accessible through Discovery Education’s Streaming services. On October 25, Operation Prevention hosted On the Frontlines of the Opioid Epidemic: A Community Fighting Back – a Virtual Field Trip that transported students to Huntington through an engaging and immersive experience to an American city faced with the opioid epidemic. During the Virtual Field Trip, youth heard personal stories from the city’s bravest teens and change-makers doing their part to combat the epidemic. Following the experience, educators and communities were provided access to a companion activity that helped to start a dialogue about the epidemic’s impacts.